The Napoleon Bonaparte Broward Bridge (Dames Point Bridge) carries Interstate 295 over the St. Johns River northeast of central Jacksonville near Blount Island. Opened in March 1989, the cable-stayed bridge is one of the tallest in the Southeast. Photo taken 03/03/13. Interstate 295 forms the suburban beltway loop around the Jacksonville metropolitan area. Built and opened in stages between 1967 and 2006, the loop is split between the West Beltway and East Beltway. The West Beltway carries the original 35 miles of I-295 from I-95 in Southside to Mandarin, Orange Park, Westside and Northside where it meets I-95 near Jacksonville International Airport (JAX). The newer 26-mile East Beltway continues I-295 from the West Beltway and I-95 through Northside and Arlington to the West Beltway in Southside. Major reconstruction of the I-95/I-295 North Interchange started in November 2016. The $176.8 million project replaces left side ramps from the beltway to I-95 with high speed flyovers. The work through Spring 2021 also replaces ramps from the East Beltway north to I-95 north and from the West Beltway north to I-95 south. A collector distributor roadway being built along the eastbound lanes of the East Beltway will eliminate weaving traffic between I-95 and adjacent U.S. 17 (Exit 36). This work was preceded by the addition of a flyover that replaced a loop ramp from I-95 south to the East Beltway in August 2010. Construction adds two sets of tolled Express Lanes along heavily traveled sections of the Jacksonville Beltway. An $89 million design-build project started in July 2014 adds a 12-foot lane in each direction of I-295 from I-95 west to the Buckman Bridge. Work running through Spring 2019 also includes adding noise walls and drainage ponds. The second Express Lane addition for I-295 expands the beltway from SR 9B (Future I-795) north to SR 202 (J. Turner Butler [JTB] Boulevard). Construction here runs from Summer 2016 to mid or late 2019. Costing $139.9 million, construction through east Jacksonville adds two additional 12-foot lanes in each direction in addition to noise walls and storm water ponds. Interstate 295 northbound heads west on the Buckman Bridge over the St. Johns River. A pair of four-lane bridges carry traffic between the suburbs of Mandarin and Orange Park, southwest of central Jacksonville. Photo taken 12/30/06. 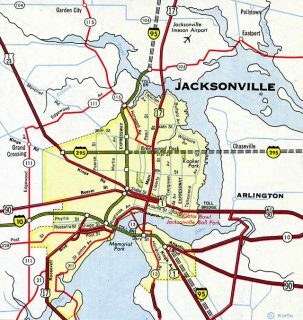 This inset from the 1962 Rand McNally North American Road Atlas shows Interstate 295 proposed along the 20th Street Expressway across north Jacksonville. Later renamed the Dr. Martin Luther King, Jr. Expressway, the route of the then 20th Street Expressway eventually curved southward to tie into the west end of the Mathews Bridge (Florida 115). The segment east from the St. Johns River was never built. 1962 – An early possible segment of Interstate 295 was shown as signed along the then-new 20th Street Expressway from U.S. 1 to Interstate 95; this section is no longer part of Interstate 295 and is now signed as U.S. 1, Alternate U.S. 1, or Florida 115. 1967 – The modern section of Interstate 295 first under construction from Interstate 95 northwest to Orange Park. 1970 – Interstate 295 opened from Interstate 95 northwest to 103rd Street. Freeway was under construction from 103rd Street north to Interstate 10. 1973 – Interstate 295 opened from 103rd Street north to Interstate 10. 1975 – Interstate 295 opened from Interstate 10 north to Commonwealth Avenue. 1977 – Interstate 295 opened from Commonwealth Avenue north to Interstate 95 northwest of Jacksonville. Western half of the Jacksonville beltway was now complete. 1983 – Future Interstate 295 opened from Interstate 95 east to U.S. 17 north of Jacksonville, which is the first section of the eastern half of future Jacksonville Beltway to open. 1986 – Signed as Florida 9A, the section from U.S. 17 southeast to Florida 105 (Heckscher Drive) opened as a two-lane freeway. 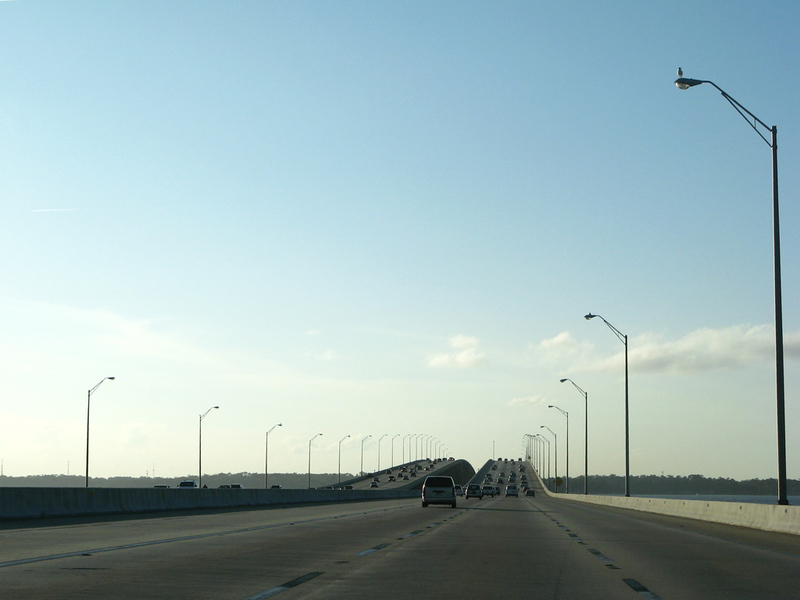 1990 – Interstate 295 opened on a new bridge across the St. John&apos;s River from Florida 105 (Heckscher Drive) south to Monument Road. The bridge was signed as Interstate 295 between 1990 and 1993. 1993 – Previously signed sections of Interstate 295 on the eastern half of the Jacksonville Beltway are re-designated as Florida 9A. 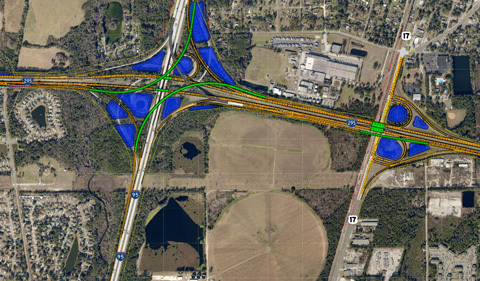 1999 – New section of Florida 9A was under construction from Florida 202 (J. Turner Butler Boulevard) south to U.S. 1. The connection between the existing segment (from Monument Road northward) and the new segment (from Florida 202 southward) is made via St. John&apos;s Bluff Road. 2002 – Section of Florida 9A south from Florida 202 to U.S. 1 opened to traffic. The portion from U.S. 1 southwest to Interstate 95 was under construction. 2005 – Florida 9A southerly connection between U.S. 1 and Interstate 95 opened to traffic. Only the section between Florida 202 (J. Turner Butler Boulevard) and U.S. 90 (Beach Boulevard) remained incomplete. Reconstruction begins at the Florida 9A/J. Turner Butler interchange. 2006 – Final section of Florida 9A between Florida 202 and U.S. 90 completed. Construction still ongoing at the J. Turner Butler interchange. 2008 – Reconstruction of the Florida 9A/J. Turner Butler interchange is finished. Florida 9A East Beltway around Jacksonville officially complete. 2012 – All Florida 9A signage is removed and replaced with Interstate 295 signage along the entire East Beltway. Crossing under Biscayne Boulevard Interstate 295 north and the West Beltway will meet Interstate 95 (Exits 35AB) to Downtown and Savannah in one mile. Photo taken 03/03/13. A single ramp leaves for Exit 35A and I-95 south to Downtown Jacksonville. Motorists must depart via a left-hand ramp to access I-95 north to Jacksonville International Airport (JAX) and Savannah while Interstate 295 continues along the East Beltway to Mayport and area beaches. Photo taken 03/03/13. An antiquated left ramp departs for Interstate 95 north as motorists continue along Interstate 295 south (former Florida 9A) to the East Beltway around Jacksonville. The airport is reached via the next exit along I-95 north (Exit 362) while Savannah is a 129-mile drive away. Photo taken 12/19/13. Former signage included the Oceanway neighborhood as a control destination for Florida 9A but was replaced by 2012 with the inclusion of Interstate 295 along the East Beltway. Photo taken 07/04/06. Interstate 295 north begins its final approach to Interstate 95 (Exits 35BA) one-half mile out from the folded diamond interchange with U.S. 17 (Main Street). Photo taken 03/03/13. Motorists bound for I-95 to Savannah are advised to use the right lane for the forthcoming departure at Exit 35B while those making a return trip to Jacksonville via I-95 should use the left lane for Exit 35A. Photo taken 03/03/13. A single lane ramp (Exit 35B) leaves I-295 north for I-95 north to Savannah. Savannah lies 129 miles to the north at the east end of Interstate 16. Photo taken 03/03/13. Interstate 295 south spans I-95 as it reaches the left exit for Downtown Jacksonville. The beltway continues 35 miles through the west side of Jacksonville and Orange Park to I-95 at South Side. Photo taken 03/03/13. On the one mile approach to the Interstate 295 beltway around Jacksonville along Interstate 95 south. Providing a bypass of the Downtown Jacksonville area, the 61-mile long beltway serves a number of outlying suburbs. Photo taken 03/03/13. A 2010-completed flyover (Exit 362A) beyond the Cole Road overpass links I-95 south with I-295 on the East Beltway. Exit 362B follows in a half mile for the West Beltway portion to Interstate 10 and Orange Park. Photo taken 03/03/13. Interstate 295 (East Beltway) south meets U.S. 17 (Main Street) at a folded diamond interchange (Exit 36) in one mile. Otherwise, I-295 continues east and south around Jacksonville with multiple access points to area ports and beaches. Photo taken 03/03/13. Motorists leave for Exit 362B and Interstate 295 (West Beltway) south as the flyover bound for I-295 (East Beltway) south soars over mainline I-95. Downtown Jacksonville lies 10.2 miles further to the south. Photo taken 03/14/10. Interstate 95 north meets Exit 362 to the Interstate 295 Beltway in three quarters mile. Photo taken 07/23/13. Interstate 295 (East Beltway) provides direct access to the Jaxport Terminals at Dames Point and Blount Island via State Road 105 at Exit 41. The freeway continues south from there across the Dames Point (N.B. Broward) Bridge to SR 10, U.S. 90, and SR 202, which all lead east to the cities of Atlantic Beach, Jacksonville Beach and Neptune Beach. Photo taken 07/23/13. Drivers bound for Interstate 295 (East Beltway) depart Interstate 95 north. Access to I-295 and the West Beltway is reached in one quarter mile. Photo taken 07/23/13. Exit 362B loops away from Interstate 95 north to I-295 (West Beltway) south. Interstate 295 encircles the city through North Jacksonville, West Jacksonville, the city of Orange Park, and Mandarin before returning to I-95 at Southside. Photo taken 03/03/13. Diagrammatic sign for the upcoming interchange with Interstate 95 along Interstate 295 south in one mile. Two ramps partition for I-95 north and south while three lanes continue to the East Beltway. Photo taken 03/03/13. Exit 61B will depart in one half mile to Interstate 95 north to Downtown Jacksonville while Exit 61A will take motorists to I-95 south to St. Augustine and Daytona Beach. Photo taken 03/03/13. Two lanes leave on a flyover ramp toward I-95 north to Downtown. I-95 will travel northwest through Southside and San Marco before turning briefly west to cross the St. Johns River via the Fuller Warren Bridge. Photo taken 03/03/13. Traffic departs for Interstate 95 south to St. Augustine and Daytona Beach as the flyover ramp to I-95 north spans the I-295 mainline. Saint Augustine lies 25 miles to the southeast in neighboring St. Johns County while Daytona Beach tallies a 77-mile drive. Interstate 295 south will transition into Interstate 295 north and follow the East Beltway toward Jacksonville&apos;s beaches. Photo taken 03/03/13. Previous sign bridge along Interstate 295 south near its former terminus at Interstate 95 near Southside. Interchange improvements were evident in this scene as part of the extension of the beltway east toward U.S. 1 and beyond. Reconstruction of the high-speed interchange culminated in 2005. Photo taken by Daniel Davis (10/05/02). Historic look at the south end of Interstate 295 at the split to Interstate 95 north and south. In its previous set up traffic departed via a left ramp to I-95 north while a single lane ramp curved southward to meet I-95 to St. Augustine and Daytona Beach. Photo taken by Daniel Davis (10/05/02). Spanning U.S. 1 (Phillips Highway) at Exit 338, Interstate 95 south makes its approach to Interstate 295 (West and East Beltways) in 0.75 miles. The original full-wye interchange was expanded by 2005 to incorporate the completed East Beltway (former Florida 9A) around the eastern suburbs of Jacksonville. Photo taken 07/04/06. Interstate 95 south expands to five lanes for the upcoming departure to Interstate 295 (Exit 337). 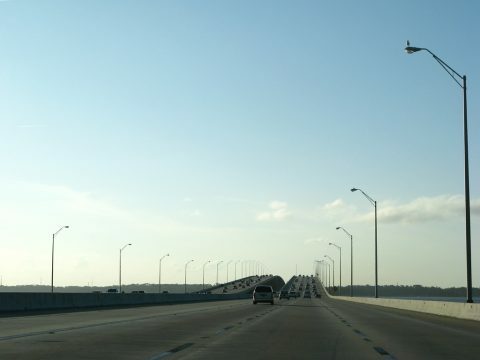 The West Beltway will take drivers toward Orange Park and the west side of Jacksonville while the East Beltway carries motorists toward area beaches and ports. Photo taken 07/04/06. Two lanes depart Interstate 95 south for Interstate 295 (West and East Beltway) as the mainline curves southeast into the massive interchange. The ramp will partition ahead for I-295 north to Orange Park and I-295 north to Jacksonville Beaches. Photo taken 07/04/06. A one lane ramp splits off for Interstate 295 north to the East Beltway as the main ramp curves to meet the West Beltway and Interstate 295 north. I-295 overtook the Florida 9A designation along the entire East Beltway by 2012, thus completing the I-295 designation around the entire Jacksonville beltway. Orange Park lies south of I-295 on the west side of the St. Johns River. Photo taken 07/04/06. Traveling north along Interstate 95 two miles out from the Interstate 295 Beltway interchange (Exit 337). 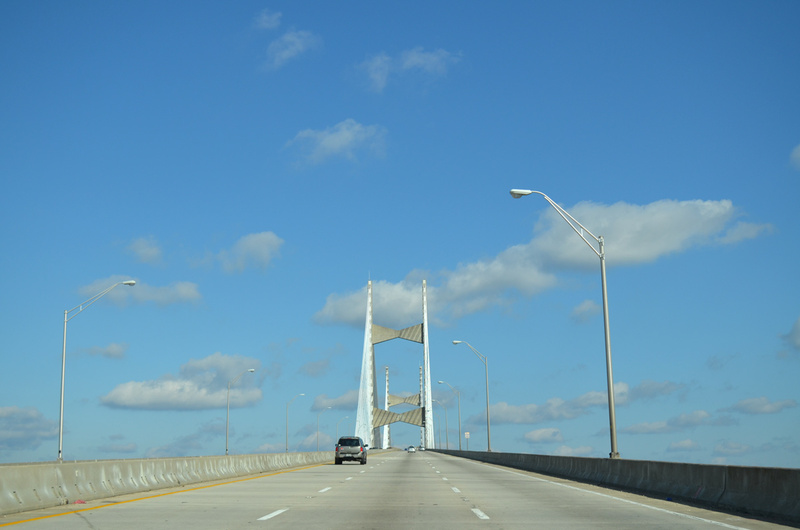 The 61-mile loop encompasses the Jacksonville metro area reaching both Orange Park and Jacksonville area beaches. Otherwise motorists prepare to depart for Old St. Augustine Road (Exit 335) in one-quarter mile. Photo taken 07/23/13. The East Beltway of I-295 serves Jacksonville Beach, Atlantic Beach, and Neptune Beach via connections with Florida 202, U.S. 90, or Florida 10. 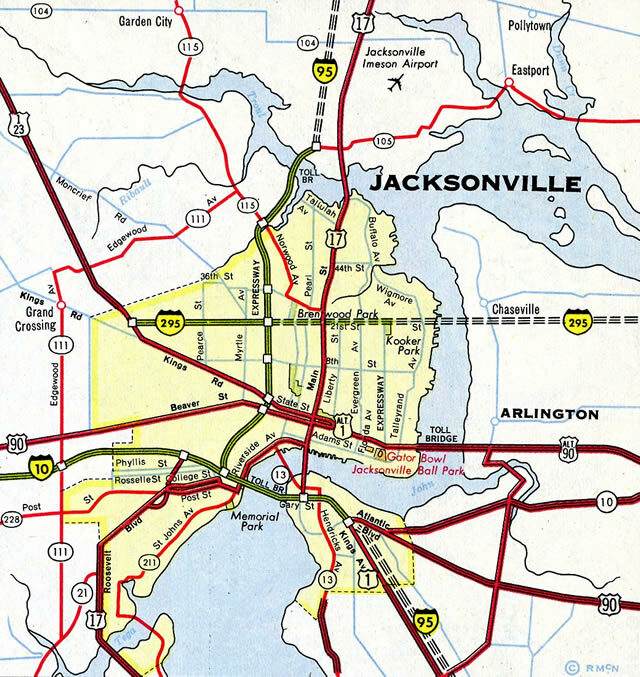 The West Beltway portion of I-295, completed between 1968-77, encircles the Mandarin, Ortega, and Springfield neighborhoods of Jacksonville while providing a direct route to Orange Park in Clay County and Interstate 10 west to Lake City. Photo taken 03/03/13. Drivers depart along the two lane ramp to Exit 337 and the Interstate 295 Beltway around Jacksonville ahead of the Greenland Road overpass. Interstate 95 maintains three overall lanes through the massive interchange as it continues toward Downtown Jacksonville and Savannah, Georgia. Photo taken 07/23/13. Passing under Greenland Road the off-ramp partitions to the East Beltway and West Beltway of Interstate 295 north. The West Beltway serves as a major commuter freeway for Mandarin, Orange Park and the west side of Jacksonville while also providing access to I-10. I-295 and the East Beltway leads motorists to area beaches and ports before returning to Interstate 95 and the West Beltway near Jacksonville International Airport (JAX). Photo taken 03/03/13. A look at former signage for the upcoming split for Interstate 295 north (Exit 337) in 2.5 miles along I-95 north. In the distance construction was evident for the folded-diamond interchange with Old St. Augustine Road (Exit 335). Photo taken by Carter Buchanan (01/03). Historic look at the one mile approach to Exit 337. Interstate 295 was allocated only one lane as it departed from a left ramp ahead. Construction and modification to the interchange removed all left-hand movements from Interstate 95. Photo taken by Carter Buchanan (01/03). A prior scene for the off-ramp (Exit 337) to Interstate 295 northbound from Interstate 95 north. Motorists using the left ramp spanned mainline I-95 south and Julington Creek prior to entering the main roadway of I-295 north. Photo taken by Carter Buchanan (01/03). "Loop nears milestone." Times-Union (Jacksonville), October 14, 2003. Florida&apos;s Interstates: A Half-Century of Progress. official Florida Department of Transportation site.